The Internet has created a global market for digitally delivered freelance work, which is currently growing rapidly. Our new Online Labour Index worker supplement reveals what skills different countries are bringing to the market. For instance, the top occupational category in the United States is writing and translation, while in the Indian subcontinent it is software development and technology. Europe’s various regions focus on different specialisms. The map is based on near-real time data from four of the largest platforms connecting buyers and sellers of online freelance work. The largest overall supplier of online labour according to the data is the traditional outsourcing destination India, which is home to 24 percent of the workers observed. India is followed by Bangladesh (16 %) and United States (12 %). 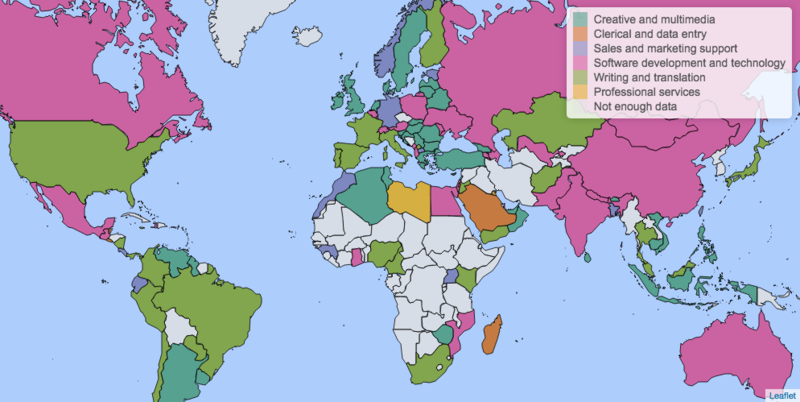 Different countries’ workers focus on different occupations. The software development and technology category is dominated by workers from the Indian subcontinent, who command a 55 percent market share. The professional services category, which consists of services such as accounting, legal services, and business consulting, is led by UK-based workers with a 22 percent market share. The Online Labour Index worker supplement is collected from four of the largest online labour platforms, also known as online freelancing or online outsourcing platforms: Fiverr, Freelancer, Guru, and PeoplePerHour. As these are English-language platforms, non-English-speaking countries’ market shares are likely to be underrepresented in the figures. Many platforms exist in other languages, but English-language platforms are the main conduits of international trade. Based on traffic statistics, we can estimate that these four sites represent at least 40 percent of the global market for platform-based online work. The figures are thus likely to give a reasonably good indication of the overall countours of the market, and especially of what skills different countries bring to the global market. Details on the methodology are available here. Europe’s regions show a distinct geographic skill pattern. 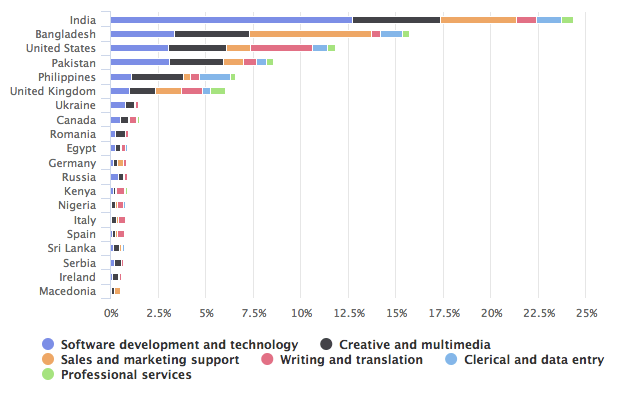 In Latin Europe the leading online work category is writing and translation, while North Europe provides creative and multimedia work as well as sales and marketing support. Large East European countries are strongest in software development and technology, which is consistent with the fact that they are also significant destinations for traditional technology outsourcing. Workers from Internet-savvy countries in Sub-Saharan Africa, such as Nigeria, Kenya, and South Africa, can also be seen participating in the market. They are especially active in writing and translation work, with a global market share in that category of about 6 percent. The second largest category in Kenya is software development and technology work, consistent with efforts to build a local technology outsourcing sector in the country. 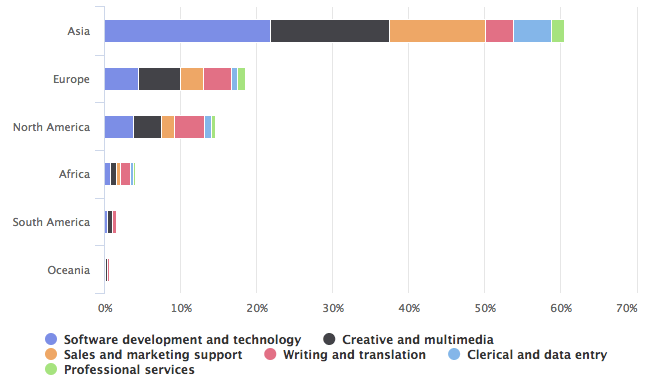 Kenya’s global market share in this category of online freelance work remains small, however, at less than half a percent. The figures in this post are based on data collected between 1-6 July 2017. Our interactive visualisation is automatically updated with the latest data from the past seven days, and the data are also available for download. Any questions and comments about the Online Labour Index are very welcome; the quickest way to reach us is via Twitter. Note: This post was originally published on the OII's iLabour project blog on 11 July 2017 10:57 am . It might have been updated since then in its original location. The post gives the views of the author(s), and not necessarily the position of the Oxford Internet Institute.